Want to make some cherry-berry deliciousness for two in just 10 minutes? 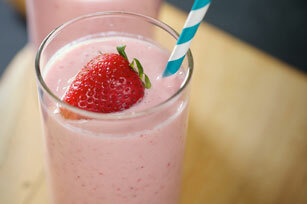 Break out the vanilla low-fat yogurt and make these sweet smoothies. No need to buy expensive frozen strawberries. Instead, pick strawberries from your garden or purchase them from your favourite farmers' market when they are in season. Wash and remove tops from strawberries, then freeze in freezer-weight resealable plastic bags up to 3 months before using as directed.